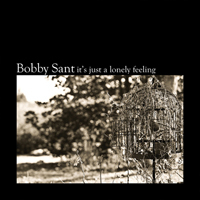 Bobby Sant has with his debut compiled a highly acoustic track list infused both with sensitive awareness and a considerable amount of punk attitude. Except for small guest contributions of piano, harmonica and electric guitars, the songs is entirely about Sant's sharp, chanting vocals, rooted somewhere between dark blues and dreamy folk music, and his fingerpicked guitar. Bobby Sant stands alone in the songs as well as in the studio and the desolation is a significant theme going through the whole album. The desolation created after the ones you've left behind, but also in the missing of the ones you haven't met yet and of the situations not yet experienced. "Music is life and death for me, literally. I think I'm a person seeing the world in black or white. The grey parts just don't interest me" "It's just a lonely feeling" is rooted in a blend between ancient folk and the contemporary indie scene in a similar way as acts like Devendra Banhart, Joanna Newsom, and Fleet Foxes. Sants' songs might not feature any lush vocal harmony arrangements but is still creating a highly intense and dreamy soundscape. And like two other big names in the genre, the fellow Swede The Tallest Man on Earth and Kentucky's Bonnie "Prince" Billy, Sant lets his songs be built up by battered and broken elements as well as sincere and tender ones. As a little bonus, the cover photos are taken by Katie Van Zandt, the daughter of the one and only Townes Van Zandt!